I am inundated with people who have dogs that are stressed when left even for short periods. This really is a major problem for some people and the major reason dogs are destructive. Some houses I have visited resemble a war zone; settees shredded, skirting bitten to pieces. And without becoming too graphic, stress does not help the toilet training. 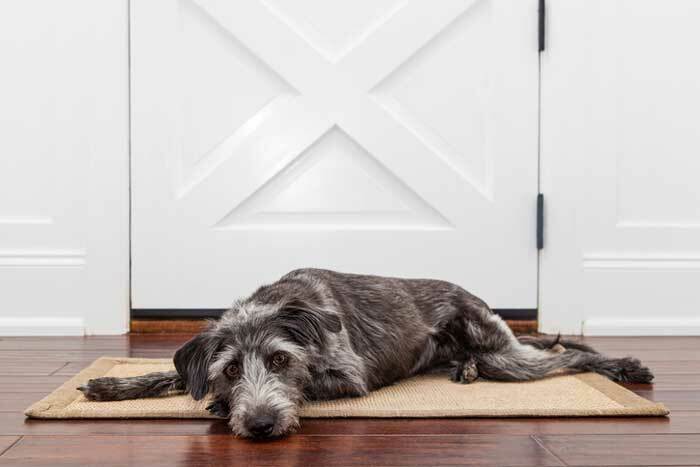 Why do dogs become anxious when left alone? Dogs always think and react instinctively and their instincts tell them they are safer when close to the pack. Nature has instilled in them that when they are alone they are vulnerable to other predators. We without realising it are punishing the dogs by leaving them alone. The pack can use this to discipline, by chasing them from the safety of numbers. The dog then has to offer its vulnerable belly and be submissive in order to be accepted back in, which is what many dogs do when the owner returns, sometimes even urinating in submission. The simple fact is that when we are with them everything good happens – feeding, stroking, touching, playing – all the pleasures that are associated with us being there with them. It is not surprising then that when we leave they become distressed and anxious, because this then is a complete opposite experience; nothing good at all happens when the handler leaves. Because of the unnatural way we keep many dogs – that is, on their own – we become their pack so we must make it easier for them to feel safe when left alone. If at all possible, make sure your dogs can mix and socialise with a variety of dogs; even better if you are not there. Most dogs that have this problem follow the owners from room to room, and are constantly reassured if they whine or bark. This needs to be addressed, so that they spend increasingly more time by themselves when the owners are actually in the house. It also helps enormously to have more people to handle and exercise the dog and letting the person who is the obsession (short term) take more of a back seat. Also, make the leaving and returning – what I call the ‘meet and greet’ – as calm as possible, so ignoring when leaving and returning. Most people really struggle to completely ignore a dog. They do not touch or talk etc but just cannot get the message about how rewarding and exciting eye contact is to a dog. It really is crucial that on returning we do not give eye contact, feeding only when they are left (use a Kong toy or feed ball). There are ‘triggers’ to this excitement, such as putting shoes or coat on, picking up keys, turning the television off etc, so these ‘triggers’ need playing out. For example, put your coat and shoes on then sit down and watch television or have your evening meal. I had a couple with a really difficult dog make a recording of the general noises in the house – talking, television, washing machine, music etc – and then play it back when the dog was placed in another room. They then went out for increasingly longer periods and he did very well. 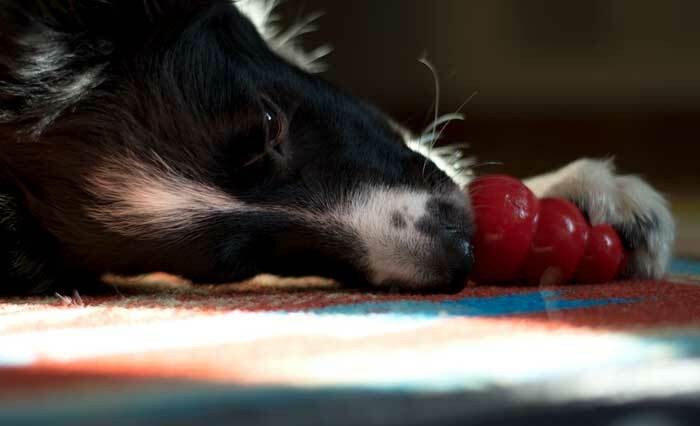 A border collie that belonged to a client of mine was an extremely difficult case, in that he could not even have a shower, go to the toilet or any of the simple things we take for granted without the dog destroying things, urinating, barking or whining. Leaving a Kong with it did not help but we had a dramatic change in the behaviour when the owner started ‘completely ignoring’ the dog; not touching, talking, looking. His wife took over completely with feeding, walking and playing. The dog was never fed unless it was on its own and then only with a Kong whenever the wife or husband came in the Kong was removed and the dog was ignored. This was done at first really quickly and then when it was obvious the dog was picking the Kong up it actually had learnt that when someone came back ‘nothing good’ happened but the food was removed. It was extremely satisfying to get a good result with this dog, and It did become a pretty normal dog, much less stressed, so therefore better behaved all round. For severe cases you can build the time up slowly. I personally find a dog that has been passed around from owner to owner can be extremely anxious because they just do not know if that owner is going to turn up. They have never had a routine and do not know what is going to happen day to day. Many particular breeds keep cropping up with separation problems, but I personally find dogs that are with owners 24/7 – especially when sleeping with them – are prime candidates for anxiety when left, whatever the breed.